Feel very fortunate to be, temporarily, in a part of the world where I could consider wearing a shawl to dinner rather than a parka. Too bad I forgot to pack one. If I had, I would take advantage of this page from an old Hermes giveaway catalogue on how to tie one of their meter-square scarves. Last time I asked, the catalogue was out of print, which is too bad, because the instructions obviously apply to any great vintage shawl--of silk, wool challis, chiffon, or some other fine fabric. 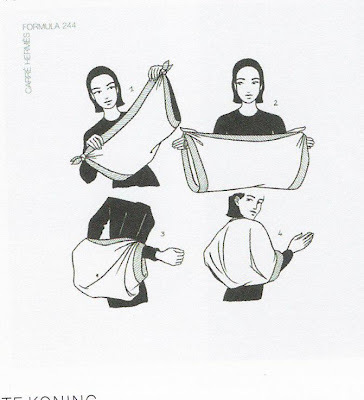 The instructions here couldn't be simpler: fold the scarf/shawl in half, knot the two upper corners together, put arms through and wear as a capelet. Perfect for keeping shoulders and back out of the chill, while leaving arms and decolletage glamourously uncovered. Thank you Hermes, and please reprint that catalogue; I'd pay for it. Cool thanks for sharing now I have a little background about hermes.